The battle of summer festivals is going strong. Very strong. 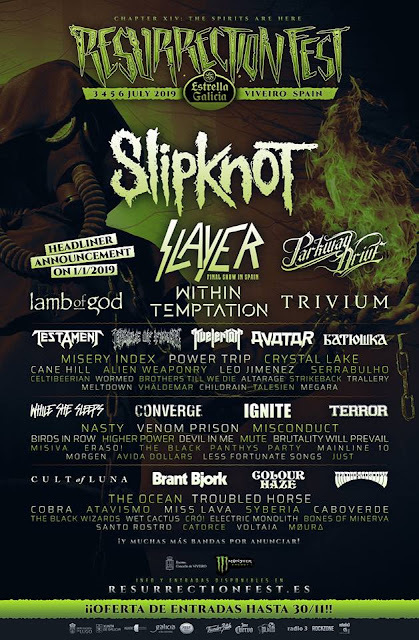 Resurrection fest in Spain has dropped a bomb of an announcement for its 2019 edition, where Lamb Of God is leading an exquisite lineup. Another headliner will be announced on January 1st but, for the time being, let's see who has been recently confirmed. The lineup so far looks like this. And it makes you wanna get tickets, doesn't it? The early bird ones are available at €129 + fees until November 30th, 23:59. For more info and tickets, visit www.resurrectionfest.es.